This article is about the Greek symbol. For the (mis)usage as a medical symbol, see Caduceus as a symbol of medicine. For the medical symbol with one snake, often mistakenly referred to as a caduceus, see Rod of Asclepius. Hermes Ingenui carrying a winged caduceus upright in his left hand. A Roman copy after a Greek original of the 5th century BCE (Museo Pio-Clementino, Rome). The caduceus (☤; /kəˈdjuːʃəs, -siəs/; Latin cādūceus, from Greek κηρύκειον kērū́keion "herald's wand, or staff") is the staff carried by Hermes in Greek mythology and consequently by Hermes Trismegistus in Greco-Egyptian mythology. The same staff was also borne by heralds in general, for example by Iris, the messenger of Hera. It is a short staff entwined by two serpents, sometimes surmounted by wings. In Roman iconography, it was often depicted being carried in the left hand of Mercury, the messenger of the gods, guide of the dead, and protector of merchants, shepherds, gamblers, liars, and thieves. Some accounts suggest that the oldest known imagery of the caduceus has its roots in a Mesopotamian origin with the Sumerian god Ningishzida; whose symbol, a staff with two snakes intertwined around it, dates back to 4000 B.C. to 3000 B.C. As a symbolic object, it represents Hermes (or the Roman Mercury), and by extension trades, occupations, or undertakings associated with the god. In later Antiquity, the caduceus provided the basis for the astrological symbol representing the planet Mercury. Thus, through its use in astrology, alchemy, and astronomy it has come to denote the planet and elemental metal of the same name. It is said the wand would wake the sleeping and send the awake to sleep. If applied to the dying, their death was gentle; if applied to the dead, they returned to life. The caduceus is often incorrectly used as a symbol of healthcare organizations and medical practice, particularly in North America, due to confusion with the traditional medical symbol, the Rod of Asclepius, which has only one snake and is never depicted with wings. William Hayes Ward (1910) discovered that symbols similar to the classical caduceus sometimes appeared on Mesopotamian cylinder seals. 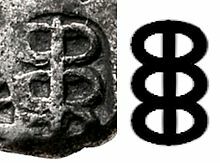 He suggested the symbol originated some time between 3000 and 4000 BC, and that it might have been the source of the Greek caduceus. A.L. Frothingham incorporated Dr. Ward's research into his own work, published in 1916, in which he suggested that the prototype of Hermes was an "Oriental deity of Babylonian extraction" represented in his earliest form as a snake god. From this perspective, the caduceus was originally representative of Hermes himself, in his early form as the Underworld god Ningishzida, "messenger" of the "Earth Mother". The caduceus is mentioned in passing by Walter Burkert as "really the image of copulating snakes taken over from Ancient Near Eastern tradition". The caduceus also appears as a symbol of the punch-marked coins of the Maurya Empire in India, in the third or second century BC. Numismatic research suggest that this symbol was the symbol of the Buddhist king Ashoka, his personal "Mudra". This symbol was not used on the pre-Mauryan punch-marked coins, but only on coins of the Maurya period, together with the three arched-hill symbol, the "peacock on the hill", the triskelis and the Taxila mark. 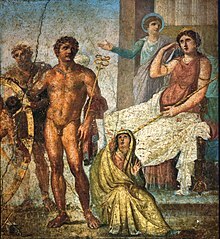 The Homeric hymn to Hermes relates how Hermes offered his lyre fashioned from a tortoise shell as compensation for the cattle he stole from his half brother Apollo. Apollo in return gave Hermes the caduceus as a gesture of friendship. The association with the serpent thus connects Hermes to Apollo, as later the serpent was associated with Asclepius, the "son of Apollo". The association of Apollo with the serpent is a continuation of the older Indo-European dragon-slayer motif. Wilhelm Heinrich Roscher (1913) pointed out that the serpent as an attribute of both Hermes and Asclepius is a variant of the "pre-historic semi-chthonic serpent hero known at Delphi as Python", who in classical mythology is slain by Apollo. A simplified variant of the caduceus is to be found in dictionaries, indicating a “commercial term” entirely in keeping with the association of Hermes with commerce. In this form the staff is often depicted with two winglets attached and the snakes are omitted (or reduced to a small ring in the middle). The Customs Service of the former German Democratic Republic employed the caduceus, bringing its implied associations with thresholds, translators, and commerce, in the service medals they issued their staff. The caduceus is also the symbol of the Customs Agency of Bulgaria and of the Financial Administration of the Slovak Republic (Tax and Customs administration). The emblem of the China Customs is a caduceus crossing with a golden key. ^ It is unclear whether the inscription refers to a patron who paid for the statue, or to the sculptor of the statue. ^ The Latin word cādūceus is an adaptation of the Greek word, itself derived from κῆρυξ kêrux "messenger, herald, envoy". Liddell and Scott, Greek-English Lexicon; Stuart L. Tyson, "The Caduceus", The Scientific Monthly, 34.6, (1932:492–98) p. 493. ^ Hornblower, Spawforth, The Oxford Classical Dictionary, third ed., Oxford 1996, p. 690 f.
^ Gary Lachman, "The Quest for Hermes Trismigestus", 2011, Chapter 3, p. x. ^ Oxford Classical Dictionary, third edition, ed. Hornblower and Spawforth, s.v. "Hermes". ^ Farnell, The Cults of the Greek States, vol. 5, p. 20, cited in Tyson 1932:494. ^ A. L. Frothingham. Babylonian Origin of Hermes the Snake-God, and of the Caduceus I. American Journal of Archaeology. 20, No. 2 (April–June, 1916). pp. 175–211. JSTOR 497115. Frothingham characterizes Farnell's simplistic view of the origin of the symbol as a "frivolous and futile theory". ^ Burkert, Greek Religion 1985: II.2.8, p. 158; Burkert notes H. Frankfort, in Iraq, 1 (1934:10) and E.D. van Buren, in Archiv für Orientforschung, 10 (1935/36:53-65). ^ Damodar Dharmanand Kosambi, Indian Numismatics, Orient Longman, New Delhi 1981, p. 73 (online). ^ Kailash Chand Jain, Malwa Through the Ages. From the Earliest Time to 1305 A.D., Motilal Banarsidass, Delhi et al. 1972, p. 134 (online). ^ "Logo of the Financial Administration of the Slovak Republic" (PDF). Look up caduceus in Wiktionary, the free dictionary. Wikisource has the text of the 1911 Encyclopædia Britannica article Caduceus.